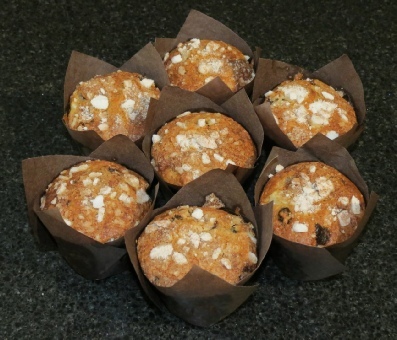  Line a 12 mould muffin tin with your chosen muffin papers.  Peel and core 2 of the apples and cut into small chunks, sprinkle with a little lemon juice.  Using a med bowl mix together all the dry ingredients - flour, sugar, lemon zest, cinnamon, bicarbonate of soda and salt.  In another bowl beat together the 2 eggs then add the milk, yogurt, almond extract and oil...mix well.  Pour the liquids into the dry ingredients and stir well until you have a smooth batter, do NOT beat.  Dry the apple chunks with kitchen paper and add to the batter along with the sultanas, stir gently to incorporate.  Bake for 25 to 30 minutes.  Place on a rack to cool.  Serve warm or cold.